At a weather research station in Makueni, Kenya, about a dozen farmers are gathered in an outdoor classroom. Scant and variable rainfall is a big problem in Makueni, so a training program from the International Crops Research Institute for the Semi-Arid Tropics (ICRISAT) is tutoring the group on drought-resistant crops. But these few smallholders are not the only ones learning — the tips on climate adaptation are also being broadcast to millions of viewers across East Africa. 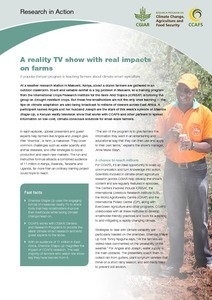 A participant named Angela and her husband Joseph are the stars of this week’s episode of Shamba Shape-Up, a Kenyan reality television show that works with CCAFS and other partners to spread information on low-cost, climate-conscious solutions for small-scale farmers. CCAFS. 2015. A reality TV show with real impacts on farms. Research in Action. Copenhagen, Denmark: CGIAR Research Program on Climate Change, Agriculture and Food Security (CCAFS).